According to the Yungdrung Bön, sometime before the 2nd Tibetan king, the letters of the Tibetan alphabet were created from the letters of the ancient Zhang Zhung alphabet. Yung Drung Bön was the state religion of the ancient country of Zhang Zhung and the texts were written in this language. However, due to great persecution in the 7th century, the texts had to be hidden in order to protect them from being forever destroyed. During this time, the Zhang Zhung language almost became extinct. However, there were a few Bön lamas who passed on their knowledge of this language. As the scriptures were being copied into the Tibetan language, many of them preserved their titles and the first few lines of texts in the old language of Zhang Zhung. This can be seen in the scriptures today. 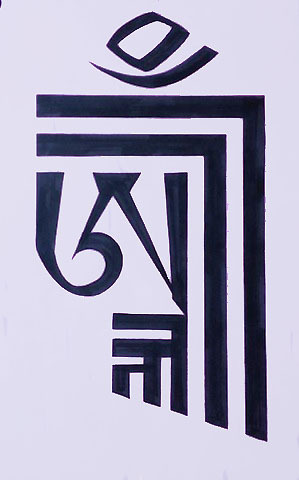 Calligraphy of the Bön syllable OM in the Zhang Zhung script as drawn by Geshe Chaphur Lhundrup of Gyalshen Institute. If you would like to purchase a calligraphy of this, or another syllable, contact Gyalshen.org. Posted on January 15, 2014, in Preservation, Tibetan Language, Uncategorized, Zhang Zhung Language and tagged Tibetan history, Tibetan Language, Tibetan letters, yungdrung bon, Zhang zhung. Bookmark the permalink. 3 Comments. Thank you, this is wonderful! Would you recommend/suggest any source covering how these 30 letters might map to the Tibetan consonants/vowels? I plan to cover that in future posts. Also, there is more than one type of Zhang Zhung script which I will also cover. There are excellent sources in the Tibetan language. In English, there are limited sources and some of them aren’t quite accurate in their history or definitions of the script/language. Thanks for checking in with the blog!